For my birthday tonight it’s Kumamoto oysters and champagne at the Aqua Grill in NYC, one of my all time favorite seafood restaurants, with one of my favorite friends. I never really liked oysters until I tasted Kumamotos from the Pacific North West. I had only had the East Coast variety, flat, slimy, briny. They are actually a different genus than the Pacific. 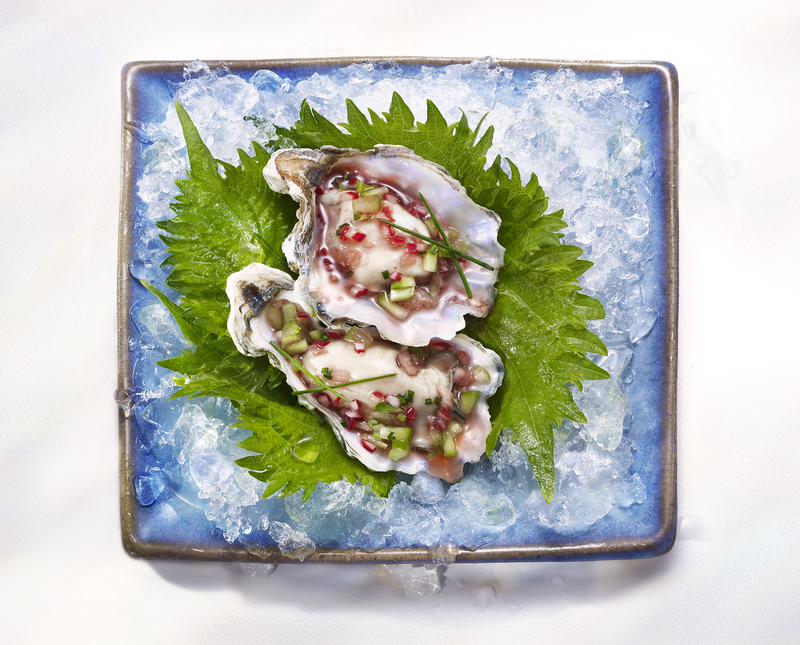 Kumamotos are the perfect bite size, pink rather than grey, plump rather than flat, sweet and creamy. And no cocktail sauce shall ever clutter the sweetness of these precious gems for me…only mignonette; sherry vinegar with minced shallot, salt & pepper, perhaps a dash of freshly squeezed lemon juice. When I do them for myself, loved ones and guests, I add another level of visual, textural and flavor panache….a little smorgasbord of toppings for the choosers whim. Finely minced cucumber, radish, chives, and celery freshen the the experience and add a pleasing crunch to augment all that creaminess. Of course the crisp splash of champagne in between bites, lends the perfect exuberance to this elegant repast. I know it is not the season to be thinking about ice cream, with all the snow we’ve been having, but I am dreaming of sunny weather and warmer days. People are always asking me how I got into this business of food styling. Well, that’s another story. I will just tell you now that when I was about 15 years old I scrutinized the packaging photos on the ice cream boxes in my mother’s freezer, while scooping the ice cream within. It was hard and I had to take tiny scoops. It looked like shards. It was nothing like the beautiful textured whole scoops on the package. I realized that the temperature of the freezer must be the culpret. I experimented with the temperature dial of the freezer until I got the results that the box of ice cream boosted. It was chocolate chip mint, my favorite, at the time. The temperature was -3’F. It was perfect. I guessed, even then I was destined to make food beautiful, though I had no idea there was such a career available. Since then, my many years of scooping ice cream for TV, print and packaging has refined my techniques. If you want to show off beautiful ice cream desserts for your next dinner party, or just for your family or lover, here are a few tips. When scooping ice cream or sorbets, the temperature is the most important variable for getting a nicely formed and textured ball. Use a freezer thermometer, actually use three, you can’t depend on the accuracy of one. Probably two will agree. Use that figure. If the temperature is not where you want it to be, adjust the freezer in small increments, waiting at least 2 hours in between to let the ice cream stabilize to the temperature change. The higher the number, the warmer the temperature. Most ice creams are best scooped between -5’F and 0’F. Flavors with more water like fruit or coffee need a warmer temperature. Flavors like chocolate and butter pecan, that have a higher fat content, need a lower temperature. More air, sugar and gum require higher temperatures. Premium ice creams have fewer of these. Sorbets and sherbets have more. Each one will be a little different. If it is too hard it is obviously too cold. If it is too soft, it is too warm, especially if it sticks in the scoop. A zeroll type scoop is the easiest to use, the newer the better. Sharpness is a plus. Keep the bowl of the scoop in a bowl of hot water with the handle sticking out. When you are ready to scoop, dry the bowl of the scoop thoroughly. Dip the balls of ice cream into your dishes. If you are making sundaes, put the dishes back into the freezer while you finish scooping the rest of the dishes. Make sure your toppings are cold so you don’t melt the ice cream, unless it is a hot topping dish. You can scoop the ice cream onto waxed paper pieces separately and assemble them as you go to make your best effort, especially if your dishes are clear glass. Clear will glass will fog up in the freezer.